King Burrito owners Ana Silva, and her fiance Sean Campbell. For nine months out of the year, Sean Campbell was away from home and his fiancée, Ana Silva, while he worked offshore as a commercial diver on Louisiana oil platforms. When the couple — who have been dating since high school — got engaged last summer, they wanted to make a change and do something together. So they opened a food truck. Silva had spent time working in Medical Lake with her family, who's been in the restaurant business for 30 years. Her dad bought a taco truck two years ago and had it up and running, but needed someone to tend to it. 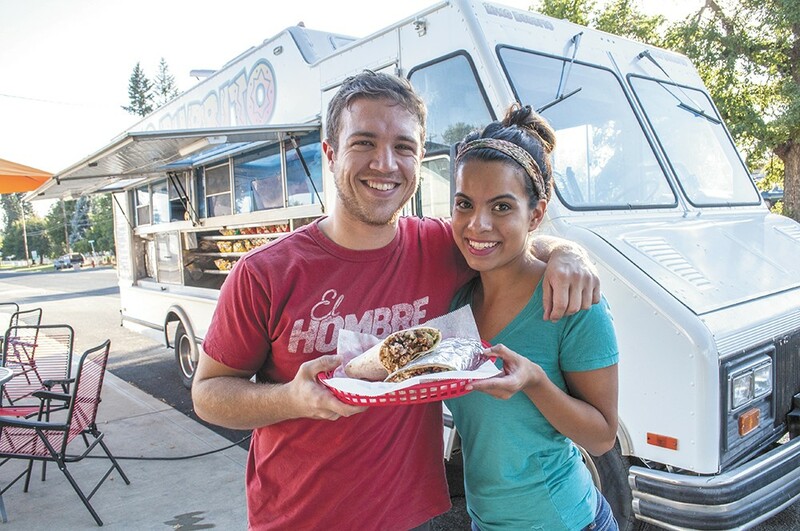 So Campbell and Silva moved back to the Inland Northwest, where they both grew up, to start up the King Burrito truck, and Campbell got some cooking lessons from her dad. "It was nice learning from an authentic Mexican cook who knows what he's doing," says Campbell. "We got good recipes." As the name suggests, burritos ($8) are their specialty. The 14-inch tortillas enveloping your choice of rice, beans, meat, cheese, guacamole, sour cream, onions, cilantro and pico de gallo make for a monstrous meal. For meat options, they cook up carne asada, adobada (marinated pork) and pollo. There are six signature burritos on the menu. The namesake King Burrito comes with chunks of pork in light tomatillo sauce, rolled with rice, whole beans, onions, green peppers and spices. Carne asada, diced potatoes, Monterey cheese and Mexican salsa is the formula for the Illegal Burrito. "That one's more of a Tex-Mex kind of burrito," Campbell says. Besides burritos, you can order quesadillas ($7) that come with lettuce, tomato, onions, guacamole, sour cream and meat, or tacos ($1.50), as well as bacon-wrapped hot dogs and rotating weekly specials like enchiladas or veggie burritos.